You don't need the expensive services of an interior decorator to add fresh style and flair to your Springs Apartments home. Feel free to "borrow" from the wide variety of examples found in TV design shows, magazines, and social media platforms like Pinterest. Here are some of our favorite ideas that are easy to do, but pack a big style punch. Which ones get your creative juices flowing? Start decorating at the bottom, literally. Area rugs can be used to define a room or simply add warmth and visual interest. 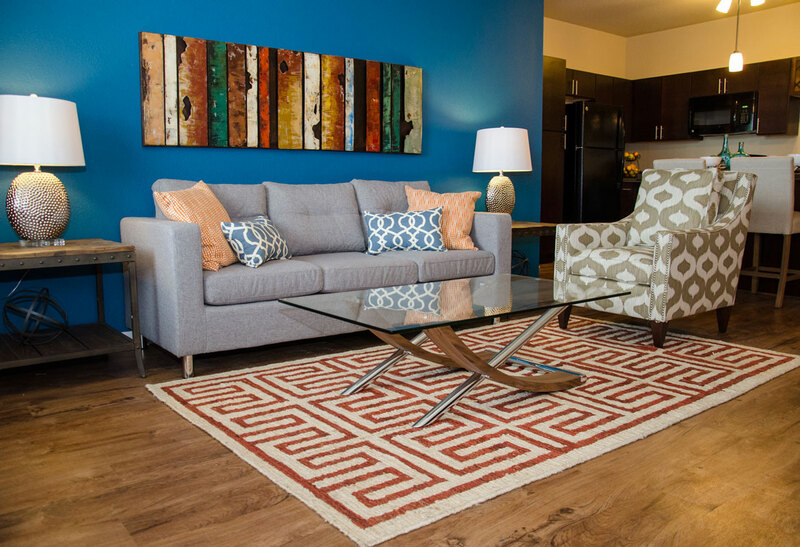 They create depth and texture when layered on the hardwood-style flooring in many of our Springs Apartments homes. Rugs come in an infinite variety of colors, patterns and shapes so you're sure to find ones that suit your taste. Mirrors can be easily incorporated in any decorating style. They are a classic way to open up a space by making it appear larger while reflecting natural light for a soft, pleasant look. Think outside the box of traditional furniture layouts. For example, there's no rule that says a couch has to be up against a wall. Why not place it in the center of the room to create leisure and office/work spaces? Add storage with a modular cube arrangement up against the back of the couch. Use our 3D floor plans and interactive floor planners to experiment with different layouts without ever breaking a sweat. Turn items that have outlived their original purpose into funky, original furniture and accent pieces. A fresh coat of paint turns an old dresser into a buffet table, while vintage steamer trunks and suitcases make one-of-a-kind coffee tables. Bookcases are not just for books anymore. A plain, Ikea-style unit is a blank canvas for paint, wallpaper, bins, baskets and other accents that convert the bookcase into both a decorative piece and extra storage. Lamps are usually thought of as practical rather than decorative. In fact, not only do they provide visual style, the light can be used to create a particular ambiance. Boost your green karma by shopping antique and resale shops for retro and vintage lamps that just need a little TLC. Do you have a favorite decorating tip to share? Tell us about it in the comments!